Gents, as mentioned, you need to ensure your ATF gets up to operating heat asap. Cold is bad as well. This is the reason the ATF flows through the radiator, it heat the fluid as well as cools. The above show the correct path if you are using a ATF thermosat. The reason why radiator specialist say bypass is that the radiator with the cooler inside does crack eventually. But the unless your car is 10yrs+ old then you have nothing to worry about. Just adding some info for those that want to listen. I'm planning to do a full flush soon and thinking I may reconfigure the plumbing like this. It makes sense that this would suit our climate better. 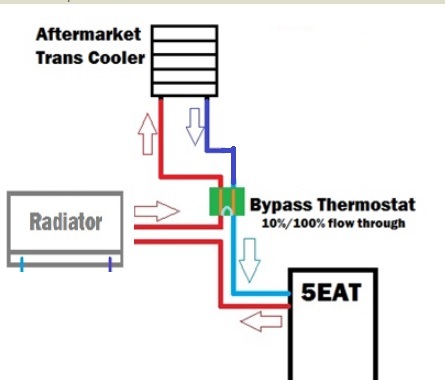 I'm having no dramas with the original setup, but it would be good to compare the different configurations in terms of how long it takes for the ATF to get to the temperature where the bypass valve opens. I finally had my transmission cooler installed today. I headed down to the rumble shack with the Davies Craig 677 and Derale 13011 and Adrian said that the thermostat bypass isnt actually needed and didnt end up installing it. Just a heads up for anyone that is interested in going down this path.